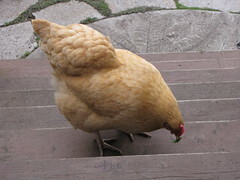 Want to raise chickens like this one? There's a class for that. Photo by Wendi. The Seattle Public Library is hosting a series of “Urban Self-Reliance” workshops, including several here at the Beacon Hill Library branch. The workshops are free and open to the public, and registration is not required unless noted in the class description below. Classes offered at other library branches include “DIY Seismic Home Retrofitting,” “Apartment Gardening with Amy Pennington,” “Introduction to Bike Commuting,” “Simple Sewing (Bags/Pillows/Potholders),” and more. For more information about the classes offered throughout the rest of the city, see the SPL website.